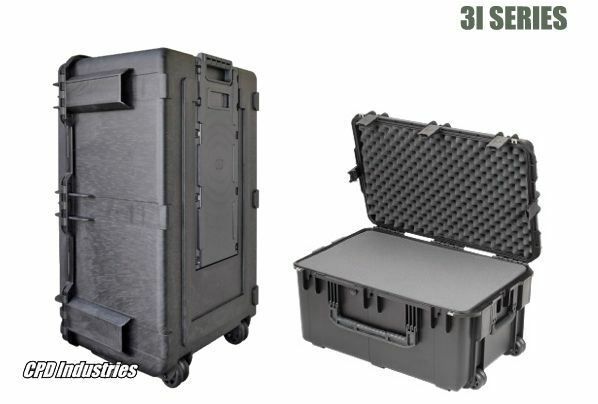 "Always outperforming the competition with advanced plastic technology and innovation"
Injection Molded Case Series - Military-Standard, submersible, multi-function equipment transport cases. At SKB Corporation after decades of innovation, some of the best things have remained the same: practicality and ingenuity. Applying this same recipe for success, SKB has added its new technologically advanced Injection Molded Product line. Inside dims. : 9 1/4" x 7 1/8" x 4 1/8"
Inside dimensions: 9 7/8" x 7" x 6"
Inside dimensions: 12" X 9" X 4 1/2"
Inside dimensions: 16" X 10" X 5 1/2"
Inside dims. : 17" X 11.5" X 6 "
Inside dims. 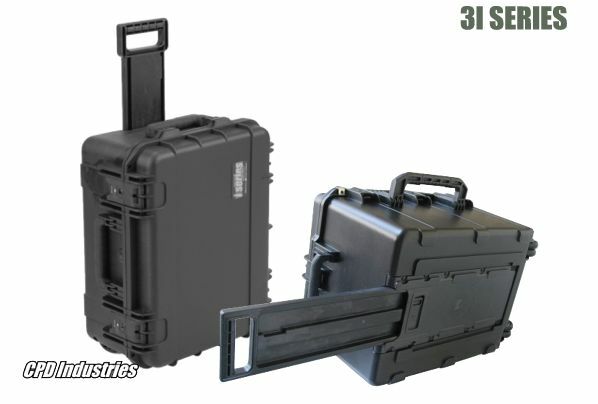 : 18 1/2" X 13" X 4 3/4"
Inside dimensions: 18 1/2" X 13" X 7"
Inside dimensions: 19" X 14 1/4" X 8"
Inside dims. : 20 1/2" X 11 1/2" X 7 1/2"
Inside dims. : 20 3/8" x 11 7/16" x 8 1/4"
Inside dims. : 20 1/2" X 15 1/2" X 7 1/2"
Inside dims. : 20 1/2" X 15 1/2" X 10 "
Inside dimensions: 23" X 17" X 14"
Inside dimensions: 29" X 18" X 14"
Inside dims. : 42 1/2 " X 14 1/2" X 5"
Inside dims. 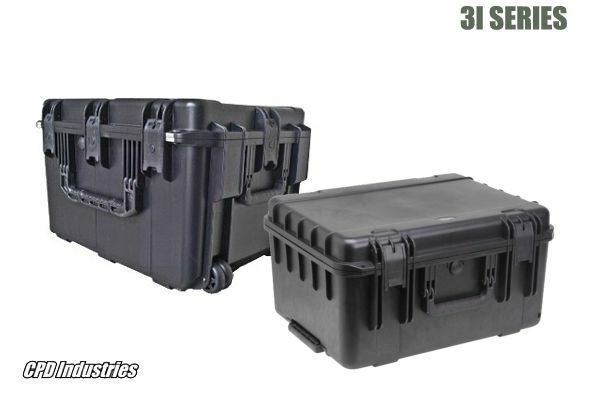 : 50 1/2 " X 14 1/2 " X 6 "
These military cases are molded of ultra high-strength polypropylene copolymer resin and feature a gasketed, water and dust-tight submersible design that is resistant to corrosion and impact damage. Patent pending "trigger release" latch system for easy opening and closing. Continuous molded-in hinge, stainless steel hinge and latch pins to prevent rusting. 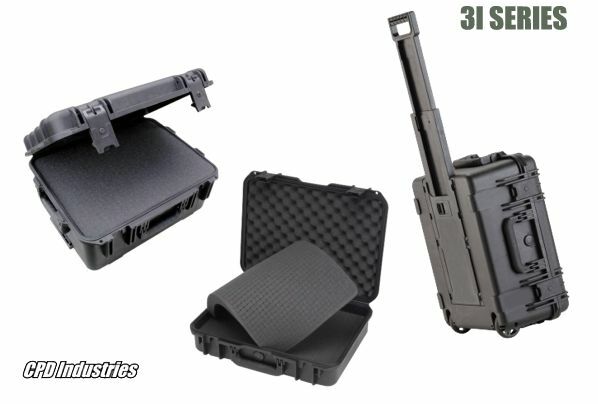 Designed with stacking in mind, these cases have deep interlocking post stacking pattern for absolute stability. 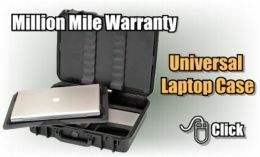 Snap down, ergonomically designed rubber over-molded handle for durability and carrying ease. Unlimited foam interior customization: pre-cut cubed foam for the "Do It Yourself" or allow us to design and custom fabricate your interiors.